Born at London, England on 23 February 1827, into a middle-class family, he served his apprenticeship in railway management with the London and South Western Railway. 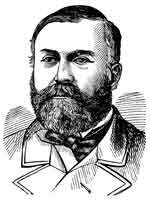 In 1852 he came to Canada as the general manager of the Great Western Railway of Canada. Here he ran roughshod over an inexperienced board of directors, nearly bankrupting the line and precipitating an investigation into his management, which exonerated him in 1861. A year later, he left the Great Western to become general manager of the Grand Trunk Railway, where he remained until 1874. He then became one of the Commissioners of the Intercolonial Railway, and in later years was Land Commissioner for the Hudson’s Bay Company in Winnipeg. Brydges was responsible for a local rejuvenation of the fur-trading company and for moving its Canadian administrative offices to Winnipeg in 1880. He became associated with an aggressive HBC and with the expanding town of Winnipeg, which he successfully championed as the location for the Canadian Pacific Railway crossing of the Red River. Although greatly constrained by his opponents, including Donald Smith, Brydges did succeed in making the land administration of the Company important and profitable. He and wife Letitia Grace Henderson (1825-1912) had three children: Charles Chandos Brydges, Frederick Henderson Brydges, and Margaret Sophia Susan Brydges (b 1864). He served as a President of the Manitoba Club and the Winnipeg Board of Trade. Brydges died at Winnipeg on 16 February 1889. He was buried in St. John’s Cemetery. Hudson’s Bay Record Society, Volume 31, ISBN 0920224016, Winnipeg, 1977. The Letters of Charles John Brydges, 1883-1889 by E. J. Rea (1981). “‘In a Business Way’: C. J. Brydges and the Hudson’s Bay Company, 1879-89,” by Alan Wilson in The West and the Nation, edited by Carl Berger and Ramsay Cook (1976), pages 114-139.